Let me tell you why I'm here. I'm here to help you stay prepared in the vicinity of your lower ankles in a stylish way. So with that said, it's the summer, it's vacation time and it's going to be hot. Why go the route of $3 flip flops at Old Navy when you can kill several birds with one stone and be stylish, comfortable and afford to get your feet wet all at once. 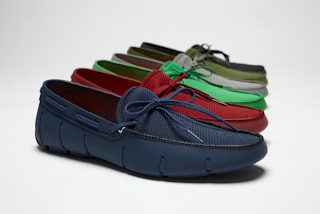 SWIMS has got your feet covered with their lace loafer that takes you from the pool or beach and straight to the eatery by the shore or the clam bake at the dock. These incredibly lightweight shoe can double as a water shoe and then be dressed up as a sophisticated sit down to eat shoe. Available in a bevy of colors, this one is sure to please and something to acquire when packing for that summer tropic getaway whether its in the Caribbean or around the corner. Check them out at SWIMS.com, NeimanMarcus.com and MrPorter.com.